In 1873 Mary Mapes Dodge wrote an article titled “Children’s Magazines” for Scribner’s Monthly, arguing for a new approach to children’s magazines: “A good magazine for little ones was never so much needed, and such harm is done by nearly all that are published” (Dodge 13). Dodge’s article described how children’s magazines were not properly geared to their youthful audience, and instead were merely water-downed versions of adult journals or overly didactic publications designed to discipline, rather than entertain, their audiences. Scribner’s editors J. G. Holland and Roswell Smith had already planned to launch a new children’s magazine; after reading Dodge’s article they knew they had found their chief editor. The first issue hit stands in November, 1873, and quickly became the most-read children’s magazine in the United States. The magazine was based out of New York but was widely embraced throughout the country and even in Europe. Dodge employed the aid of Scribner’s Monthly’s art director Alexander Drake to find the best artists to decorate the magazine’s stories and nonfiction, and St. Nicholas’s vibrant illustrations delighted readers. Along with the established adult writers who contributed to the magazine were numerous up-and-coming children writers: Edna St. Vincent Millay, Rachel Carson, and Eudora Welty saw their names for the first time in print in St. Nicholas. “The St. Nicholas League” allowed young readers to contribute writing, artwork, and puzzles, and offered monetary incentives to those who published regularly. After Dodge passed away in 1905, the magazine continued strongly for twenty-two years under the leadership of William Fayal Clarke. After his tenure ended, no editor maintained the position for more than four years and the magazine ended in 1940. In 1943 new ownership attempted to revitalize the famed publication, but only four more issues appeared before St. Nicholas shut its doors forever. It has been hailed as the most influential children’s magazine to date. The following quotations embody the spirit with which Mary Mapes Dodge began St. Nicholas. “To give clean, genuine fun to children of all ages. To stimulate their ambitions-but along normally progressive lines. “The child’s magazine must not be a milk-and-water variety of the periodical for adults. In fact, it needs to be stronger, truer, bolder, more uncompromising than the other; its cheer must be the cheer of the bird-song; it must mean freshness and heartiness, life and joy…A child’s magazine is its playground” (Dodge “Children’s Magazines”). “But what delights us in Milton, Keats, and Tennyson, children often find for themselves in stars, daisies, and such joys and troubles as little ones know” (Dodge “Children’s Magazines” 14). Mary Mapes Dodge began her career writing various essays and short fiction for adult readers. After a short span of freelancing, Dodge shifted her writing toward a young audience with the release of Irvington Stories, a book of children’s tales, in 1864 (Clarke 19). William Fayal Clarke noted, “So great was [the book’s] popularity that the publisher begged for a second series or sequel” (19-20). She obliged, releasing A Few Friends in 1869. Impressed with her work, Donald G. Mitchell and Harriet Beecher Stowe offered her a position with Heart and Home, a family-oriented paper, as editor to the juvenile and household sections (20). With each issue her reputation as an editor grew until she eventually caught the interest of Dr. J. G. Holland and Roswell Smith, editors of Scribner’s Monthly, with her essay “Children’s Magazines.” They offered her the position of chief editor of a new children’s magazine, St. Nicholas, which she conducted for the final thirty-two years of her life. For her entire run as editor, Dodge did her best to recruit the best writers and illustrators for the magazine, and operated under the mission to bring children a ‘magical playground’ and ‘escape’ through literature. Altstetter, Mabel F. “American Magazines for Children.” Peabody Journal of Education 19.3 (Nov. 1941): 131-136. Clarke, William Fayal. 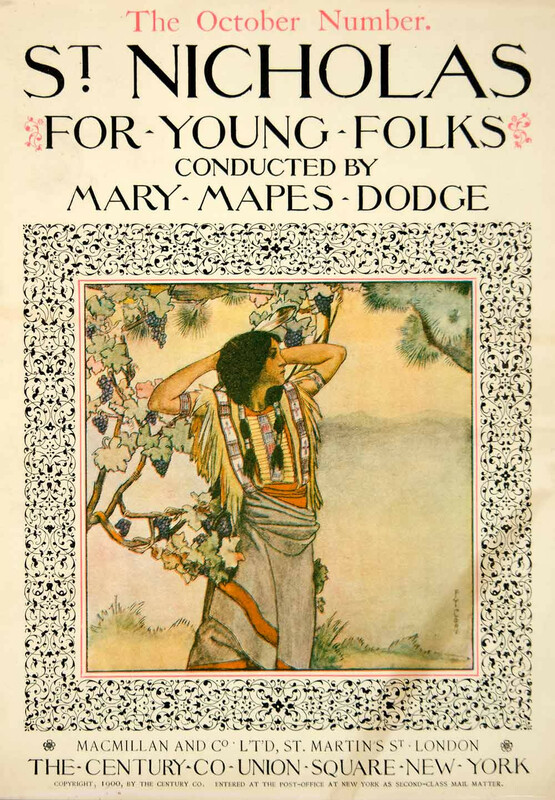 “In Memory of Mary Mapes Dodge.” St. Nicholas and Mary Mapes Dodge: The Legacy of a Children’s Magazine Editor, 1873-1905. Eds. Susan R. Gannon, Suzanne Rahn & Ruth Anne Thompson. Jefferson, NC: McFarland, 2004. 18-26. Dodge, Mary Mapes. “Children’s Magazines.” St. Nicholas and Mary Mapes Dodge: The Legacy of a Children’s Magazine Editor, 1873-1905. Eds. Susan R. Gannon, Suzanne Rahn & Ruth Anne Thompson. Jefferson, NC: McFarland, 2004. 13-17. Gannon, Susan. “Introduction: What Was St. Nicholas Magazine?” St. Nicholas and Mary Mapes Dodge: The Legacy of a Children’s Magazine Editor, 1873-1905. Eds. Susan R. Gannon, Suzanne Rahn & Ruth Anne Thompson. Jefferson, NC: McFarland, 2004. 1-9. Images. “St. Nicholas Magazine.” George A Smathers Libraries. 13 Feb. 2009. University of Florida. 9 July 2009. Joseph, Michael S. “Illustrating St. Nicholas and the Influence of Mary Mapes Dodge.” St. Nicholas and Mary Mapes Dodge: The Legacy of a Children’s Magazine Editor, 1873-1905. Eds. Susan R. Gannon, Suzanne Rahn & Ruth Anne Thompson. Jefferson, NC: McFarland, 2004. 54-75. Rahn, Suzanne. “St. Nicholas and Its Friends: The Magazine-Child Relationship.” St. Nicholas and Mary Mapes Dodge: The Legacy of a Children’s Magazine Editor, 1873-1905. Eds. Susan R. Gannon, Suzanne Rahn & Ruth Anne Thompson. Jefferson, NC: McFarland, 2004. 93-110. “St. Nicholas Magazine.” George A Smathers Libraries. 13 Feb. 2009. University of Florida. 9 July 2009. Tager, Florence. “A Radical Culture for Children of Working Class: ‘The Young Socialists’ Magazine, 1908-1920.’” Curriculum Inquiry 22.3 (Autumn, 1992): 271-290. “The St. Nicholas Tribute Page.” Flying Dreams. 9 May 2007.